Integration with Slack is one of the key reasons why companies continue to migrate to the growing chat platform. Recently Slack shared some metrics on their growth and it continues to be impressive with 8 million daily active users spanning 500,000 teams with 3 million paid users. To date Slack has done the best job of promoting integration as a key differentiation in the platform and developers continue to release apps to help integrate Slack with many different platforms. The competition is growing in the space with offerings from Microsoft, Google, Facebook and Atlassian looking to capitalize on the success of Slack. These platforms have a varying degree of integration support and promotion of integration but all continue to iterate to bring more value to their chat platform. One of the most common integrations for teams of all sizes is a connection with Agile development tools. This suite of software solutions help teams running agile processes to spit projects into sprints and activities into tasks and sub-tasks. Keeping everything organized is a key tenant to success in Agile development and a number of platforms exist to help the process. A few of the most common platforms are Atlassian Jira, Trello and Asana. Each has its own advantages and disadvantages and work best for teams based on their maturity and complexity. In all cases however the integration with chat platforms is a critical aspect of keeping everything moving. When chat platforms are integrated with development tools the process moves faster because everyone stays on the same page and users don’t have to constantly switch between apps losing precious time. Jira Cloud by Atlassian – this free plugin allows Jira Cloud customers to get ticket information when issues are mentioned. It will find issues in chats and automatically expand information about the ticket. Disadvantages: Single Feature, Only available for Jira Cloud, Requires configuration for each channel. Jira Server Alerts – this plugin utilizes web hooks in Jira to push updates to channels when updates are made in Jira. Slack Jira Integration – This plugin also known as Jira Integration+ represents a premium alternative to free solutions. It is targeted towards teams that want to do more with integration with Jira and comes packed with many more features then the free alternatives. Advantages: Full integration with Create, Assign, Transition, Comment, Edit, Schedule, Log Work, Notifications, and more. Jira Server Slack Integration – Teams running a self-hosted Jira Server solution should not feel left out when it comes to Slack integration. This solution offers the same deep integration available for Jira Cloud teams and is compatible with Jira server versions released after 2016. For teams using Trello the official integration between Slack and Trello is likely the best bet. Slack Trello Integration – this plugin offers a deep integration between Trello and Slack and mirrors many of the features that Jira Integration+ offers with it’s Slack to Jira integration. If Asana is your Agile platform of choice the official offering also looks fully featured. Slack Asana Integration – Allows users to take action directly from Slack. Users can creates issues, add comments, etc right from Slack. When looking at the options available for integration with Slack it is clear there are many good choices to keep your agile process moving. All provides with fully featured solutions are touting the prevention of context switching and streamlining the process. As hundreds of thousands of teams utilize these solutions and continue to write positive reviews it is clear that at least some of these promises are being delivered. What do you think? How does your team integrate your Agile tool with Slack? Any solutions missing from my list? PS – For those looking for a Jira Stride Integration that works with Jira Cloud and Server check out Chat for Stride from Nextup. It appears to be a fully featured integration and will likely gain some traction with Jira Server teams looking to migrate from HipChat to Stride. I recently migrated from my 17″ MBP to the new retina macbook and noticed that the battery life was not what I was expecting. The retina macbook seemed to be running hot and that battery would drain far quicker than expected. After a bit of Googling I found some discussions on the Apple forums around a hung “dock” process that can get left over after migration assistant runs. In my case I used a time machine backup to restore to the new Retina Mac so I decided to take a look. I pulled up the activity monitor (global search for activity monitor) and sure enough I had a “dock” process running 100% of one of the cores. I took a look at my battery and had 75% power and 1:35 remaining (of course this is not what is expected with a new MBP). The dock will disappear for a second and then come back and the process should be remove from your activity monitor. As soon as I ran the commands the system slowed down and the CPU usage went way down. As I type the battery says 64% and 3:12 hours – much more like it. I had a request today to to add WYSIWYG support to the transactional emails section under “System” > “Transactional Emails”. It appears that it is pretty simple. You should how have WYSIWYG editing ability in transactional emails. This extension lets you hide certain states on the front end to prevent customers from selecting them during checkout, estimate shipping, payment, etc. One common issue that many users of Magento (Community and Enterprise) is the list of states (regions for non-US) displayed to customers during checkout, registration and estimate shipping. When Magento is first installed a number of items exist for the United States that are not commonly shipped to or need specific shipping rules. In the case of my medical supplies business we had flat rate shipping to the lower 48 states from our supplier and were charged very high rates to ship to Hawaii, Alaska and other US territories and military locations. We wanted to handle shipments to these locations offline to ensure we did not lose our shirts on shipping. One way to achieve this is to modify the collections.php file here (created local version): /app/code/core/Mage/Directory/Model/Mysql4/Region/Collection.php to alter the regions array returned. If you like getting into the code and want to redo this update when you upgrade Magento this might work well for you. There is now a FREE way remove displayed options in shipping and billing in the administrative interface via a new extension. 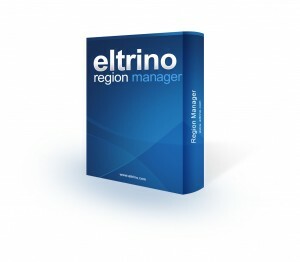 The “Remove or Change States and Regions” extension is the first extension developed in a joint venture between my company and Eltrino consulting (a team of Magento Rockstars based in Keiv). After selecting “Region Management” the configuration screen is displayed. Click “New Region Configuration” to add exclusions for a Country (multiple Countries can be configured by adding additional configurations. Save your updates and clear the Magento Cache (System > Cache Management > Flush Magento Cache). Check your customer website and the excluded options will be removed. 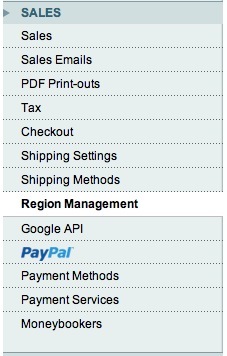 Excluded areas are not displayed as options for billing address, shipping address, estimate shipping and customer registration. For customers who want further flexibility we are going to offer an enhanced version which allows these values to be specified by store/website and for each area (IE – allow Hawaii for registration but not for shipping address). Please contact me if you are interested in this enhanced version and would like to give input on features and functions. The extension is compatible with Community 1.4 – 1.6 and is currently under review for a Trusted Extension for MagentoGo. The extension is also upgrade proof and will be modified if needed for future Magento versions. One of my major Magento Enterprise customers just launched the onestepcheckout extsion – http://www.onestepcheckout.com as an A/B test with the existing multi-step checkout process. We are using Google Website Optimizer to test the variations and I will have some data starting today. I will update this post with results of the test. I know others have experienced a lift with this extension and I am excited to see how it works for us. The new Ford Motor Company Accessories website is now launched on Magento Enterprise.